Serves: 4 people Difficulty ': Media Preparation time: 1 hour 40 minutes Ingredients 1kg. Chestnut 150gr. 100g of dates. 250g candied orange peel. 30g of sugar. 30g of icing sugar. unsweetened cocoa powder 8DL. 2 dl of milk. 1dl cream. Grand Marnier 1 teaspoon of vanilla extract 1 pinch salt PROCEEDINGS -------------------------- Slit the chestnuts and using a sharp boxcutter in scald water lightly salted boiling water for 10 minutes, until they start to open. Drain, peel while still hot and put them in a saucepan. Cover with the milk, bring to a boil and cook for 40 minutes. After the specified cooking time, add sugar and continue cooking for another 10 minutes, until you and 'dissolved. Spend the chestnuts through a sieve and collect the puree into a bowl. Add the vanilla, liquor and cocoa dropped from a sieve. 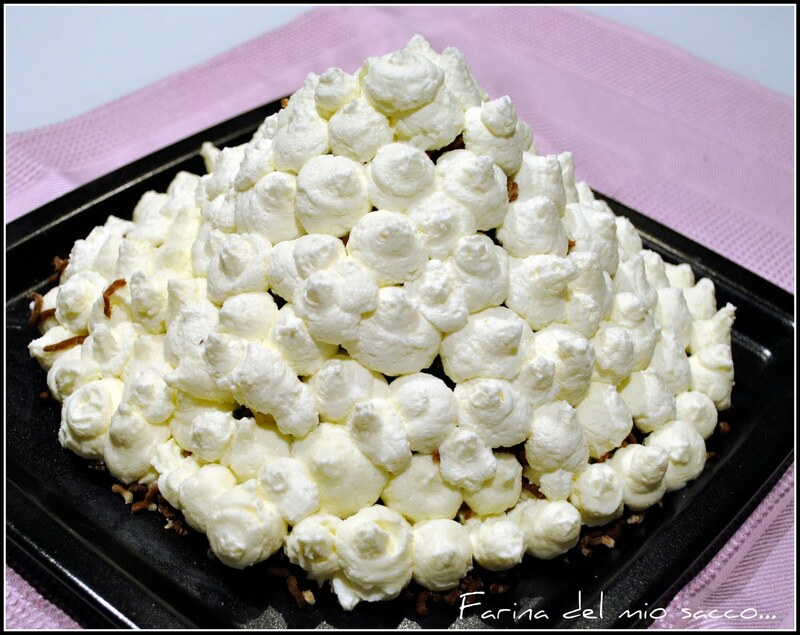 Whip the cream with icing sugar and incorporate the mixture of chestnuts. Cut the candied orange peel into small pieces. Divide the dates in the middle 'and remove the stones, cut the flesh into small pieces and add them to those of orange. Transfer the mixture of chestnuts in a pastry bag with star nozzle and let down in tufts on a serving platter, forming a pyramid-like mound. Decorate the cake with whipped cream and sprigs of chopped dates and orange peel. Keep in refrigerator until serving.